DO-93520-00 was succesfully added to your cart. What is the minimum duration cycle on/off of the ew-93520-00? The minimum amount of time between cycles would be approximately 10 seconds. I want to replace a gold line set point controller that uses a 10K @ 77 deg F thermistor. The sensor is working and sealed in a wall. Do you have a option for this controller? This controller is designed for a thermistor specified at 1000 ohms at 77 deg. F. Please contact our technical application specialists for additional assistance (contact information can be found in the "contact us" section on the web page). If the controller is reading 150 and the actual temp (check with a calibrated temp sensor) is reading 154 can I adjust the controller to read 154. Yes, this does have the ability to set the temperature of the unit to match a known temperature you have available. can I buy just the probe for this product? Yes, please see part number 93520-23 for the replacement probe. Can this unit be set to cool when the temperature is above a certain temp and heat when it goes above the temperature? No, this unit only has one relay so it would only be able to turn on/off one device. you would need to look an item with dual controls. 89802-52 will provide two relays that can control a heating device and a cooling device. The controller will also allow you to set a high and low point to activate each device. Would this also work at 120 VAC? Yes, this unit can also be used at 115 and 120V. Could this controller be used to control roof deicing cables over the range of 15 deg F to 35 deg F (ON within that band)? Power input would be 115vac, 800 watts total for 2 de-cing cables (400watts/each). Seems to me it would work fine but the only question I have is how rugged it is in an external enclosed environment (outside in a sealed box). Maybe I should keep it inside, but then could I extend the temp sensor outdoors some how? 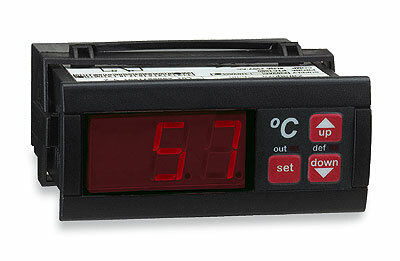 The ambient conditions are the conditions in which the controller will operate. That range is Ambient Temp: 14 to 158°F. I would suggest keeping it indoors if the outside temperature will go below that lower limit which I assume it will if you are using this with de-icing wires. Is the thermal probe liquid tight (submersible)in light oil? Yes, the probe is submersible/waterproof. Yes it is liquid tight. I ordered TS-13010 unit displaying temp in F. Can I reprogram it to grad C? You may select either F or C but the label is always F. Purchase instead model TS-13011, sku 93520-10, if you actually want it to be setup in degrees C.
in the event of a power interruption , would this unit need to be reprogrammed or will it resume operating where it was previously set ? thanks for your time . I have one of these. It remembers its setting even after months of sitting in the closet with no power. Its a great tempature controller for both hot and cold. I have one of these. It will resume where it was last set. This will resume where it left off. I used this device to turn on/off AC power to my refrigerator compressor and fan. At first it didn't work, but I found that it DID work when I reconnected the AC to be switched to the relay common rather than to one of the other relay (NC or NO) connections. So this is evidently not pure mechanical relay. Instructions should say something about this. I use this to control temperature for a fermentation chamber used in brewing beer. I have wired this in place of a thermostat controller that came standard with a Kenmore chest freezer. So far, it works flawlessly. Also, I very much like the way it was designed to be installed to look professional. All I need is for it to activate a solenoid at 103 F works great, very accurate, great price. Compact controller with lots of features. Programming is easy, calibration was right on, even after I extended the length of the probe a couple feet. One thing not noted in the specs is that there are NC 'contacts' as well as the NO 'contacts', so you could control two valves or relays with this controller (no. 1 open, no. 2 closed when not operated, reverse when operated). I used this temp controller on a Keezer project. I turned a 5.0cu. ft. chest freezer into a kegerator. I needed a temp controller that could keep the freezer at around 40F and this product does a great job. I was able to wire it easily and install it into the front of the freezer. It looks factory installed. Just wish they had different color LED options instead of just red. Will buy another for another project soon. Great controller......the directions are a bit weak but it is a simple learning curve. Recomend it for anything that needs a temp controller. Great Product with the exception that the plastic mounting tension bracket and rear safety cover have a very "cheap" fit. I am using this to control cooling fluid and brew fermentation temperature. Great control. I use this to maintain mash and sparge temperatures when brewing. It opens and closes an ASCO gas valve for my propane burners. It could also be used to control fermentation and lagering temps. Great little control at a resonable price. We are a HVAC contractor and have used a lot of thermostats this one is great if you can panel mount it. It would be great if an enclosure was available to house the unit when panel mounting is not practical. I have purchased three of these! I use this product in home brewing both in the controlled heating of the wort and in controlling the cooling of the fermentation process in lager beers. I have this controlling an upright freezer for fermenting beer at specific temperatures. Installed easily once I found additional documentation on the web. I use the product to regulate the temperature on my ice cream freezer. It does well. I just wish it came with a housing to hold it and keep it dry. You either have to make one or buy something. Do a little research and you'll find a solution. Alot of home brewers use this item. Also the wiring instructions are POOR. Research them and you will find it. Look for "Love wiring diagrams (item number here)" When you actually see how to wire it up, you'll wonder why the manual that comes with it is even included. Using it is a little difficult to use until you get used to it. I've bought three of these in the last few months. They were certainly economical at around $50 for the first couple I bought, however their price has gone up by 40% to [$]. I'm looking for cheaper alternatives because of this. Until then, it is still recommended, but with some reservation. This unit works great. I really like the price too. I use three of them to run my homebrewery. One runs my chest freezer that I use as a kegerator, one runs a upright freezer to maintain fermentation temperature, and the other unit it used to control a solenoid valve to supply gas to the burner of my HLT. I highly recommend this product. I now sleep in comfort. It has given me a reprieve from having to remove a waterbed mattress and replacing an intermittent temp controller. Perfect if it does what you want. Works perfect as a controller for a refrigerator i'm building. Display is plenty bright. Settings are about as easy to use as they could be with as few buttons and display characters it has. Instructions could use a little more detail on what each parameter effects, but it's not that difficult to look up the wording from the manual on the 'net and figure out what it's talking about. Overall, couldn't be much better for the money/size, no real cons to speak of. Being used with Asco valves to control burners on home brewing system. Only one degree off as delivered. Unit cycles on at -2 degrees from set temp. and cuts off at set temp. Very easy once you learn/read directions! Great product, plan to buy another. I put inside an electrical box I bought at [...]. Mounted on the wall, and can control a heater or the freezer. Product is used in an upright Freezer for use as a Fermentation cabinet. Initial installation and set up can be a bit intimidating but is actually quite simple with good instruction. Learning curve isn't as steep as it may appear. You will be able to effectively opperate this product with a very basic knowlege. The control is very compact which allows for nearly endless installation and application options. Very precise and accurate; a set and forget item. Can't recommend this product enough. Good product[...] Just tried it out on a small refrigerator (4.4 cu) that i use to ferment/lager home brewed beer. It has a 2 degr F differential, so Temp is maintained pretty accurately. I wired it myself and not beeing much of an electrician i made some research to make absolutely sure i was doing it right, but all things considered the instructions are enough if you read them. Easily used to make a temp control for winemaking.The instrument has relay that is rated high enough not to require adding relay. Rear cover adds too much to depth when installing within a project box. You can see how mine came out on previous photo. Once I figured out how to set my parameters for the controller, It was simple but I had to go through 5 steps to complete the programming. So far the controller is holding the temp in my keg fridge to 38-42 degrees. I gutted an old cable box so it looks like semi-pro installation and installed the controller in it. I use the controller to turn on a 60 watt light bulb to warm the inside and leave the fridge unplugged in my unheated Northeast Ohio garage. The owner of our local homebrew store also owns one.[...] I recommend this product if you like to build things yourself. Go to[...] for a simpler wiring diagram or just Google search Loves TS. I use two of these to control a freezer for a kegerator and one to control a fridge to ferment homebrew in. They work great and not to hard to wire. It is a little too large for what it does. I prefer the size of the 32DIN controllers. This device is used as a redundant aux. temp. control to back up my 32DIN controller.